Infrastructure are items that are essential to enable, sustain, or enhance societal living conditions in a new development, and include roads, water supply, stormwater management, sanitary sewers, electrical grids, telecommunications, and so forth. 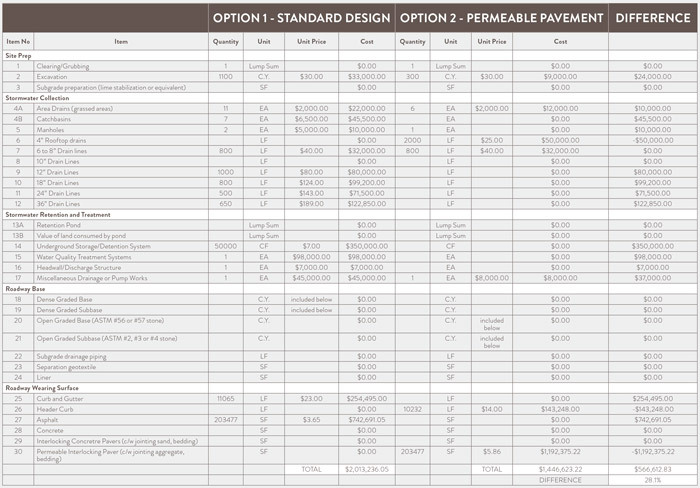 Experience has shown that we can lower total infrastructure costs with permeable pavers. PICP infrastructure costs are lower than conventional roads and stormwater management systems. The cost benefits of permeable paver systems are realized through the reduction or elimination of the stormwater works, including catchbasins, manholes, underground pipes, ponds, treatment systems, and associated appurtenances. The following is an example of an infrastructure analysis conducted for a subdivision development in cooperation with the design firm. The capital cost savings were $566,612, or a net savings of 28.1% as compared to the original design approach. Although we cannot guarantee the infrastructure cost analysis will prove PICP to be less in every circumstance, we are willing to assist with the analysis to determine if a PICP system is ultimately more economical. Source: USEPA "Case Studies Analyzing the Economic Benefits of Low Impact Development and Green Infrastructure Programs" August 2013. Consider the ever increasing cost of oil, the increased design life of pavers, the ease of maintenance, and the capital savings realized through mechanical installation, and the end result is a superior, more aesthetically pleasing surface at a lower cost. Speak to a Belgard Commercial representative about how you can save money with permeable interlocking pavers.